Diego Maradona has offered a $10,000 an equivalent of UGsh:38,500,000 rewards to whoever identify the source of reports that claimed he had died after Argentina’s World Cup match against Nigeria, According to his lawye . There was roumours and voice message which circulated on Social Media stating that the football star had been hospitalized and had died of cardiac arrest. “I gave instructions to make public the decision to offer a reward of 300,000 pesos (around $10,000) to anyone who can provide true and accurate information about the author of the audios,” lawyer Matias Morla told Argentina’s Clarin daily from Russia. 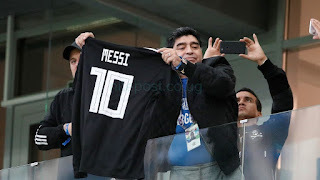 The Argentine star look ill at the end of the match and had to be helped from his seat by his assistants however he denied rumors of ill health one day after. According to Morla, Maradona shouldn’t even have been at the stadium for the second half of the game, in which a late goal secured Argentina’s World Cup. “The doctors told him to rest, not to stay for the second half of the Argentina-Nigeria match, but asking that of Maradona is like asking a son not to love his mother.” Morla said. It is also believed Marodona 57, suffered from high blood pressure however Maradona claims he is in perfect health.